A Stiltz Home Lift provides a safe and easy way to move from floor to floor when the stairs in your home become too much. Please use our contact page to request further information. An alternative solution for easy access around your home. The Stiltz Homelift makes life easier if stairs become too much. A compact, discreet and stylish home lift is the perfect alternative to a stairlift. Install it in the corner of your living room, hallway or kitchen. It can also be fitted in a cupboard or within the turn of your stairs. That’s because of the unique rail design which takes up very little room. Whether you need a home lift now or are future-proofing, move safely between floors with a Stiltz Homelift and stay in the home you love. 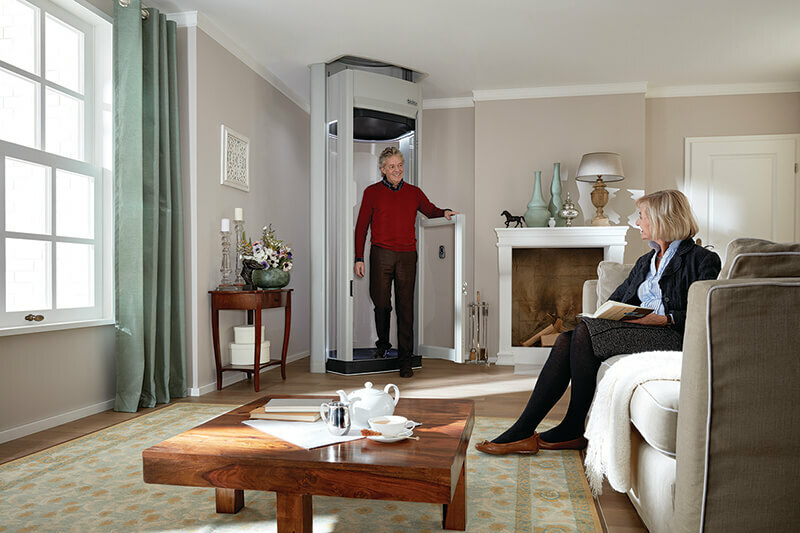 The Stiltz Home Lift is a domestic lift that can be installed into most homes in the UK. Stiltz domestic lifts are roomy, comfortable and safe. They can carry up to three people and even a wheelchair when required. It’s also useful to move heavy items such as a suitcase or vacuum cleaner. The quiet drive system uses no noisy external hydraulics or vacuum system. Plus, for safety, there is a battery backup, obstruction sensors, key lock, and optional seat and grab bar. For more information on the Stiltz Home Lift please contact us today.